Some information on the yarn: It’s 2-ply Sock Weight 100% SW Merino Wool Yarn. 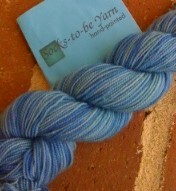 A 100 gm/3.5 oz skein has approximately 365 m/400 yards. The Knitting Gauge per the label is 6 stitches = 1 in on Size 3-5 Needles. The Crochet Gauge per the lable is 16-20 sc = 4 inces on E-7 hooks. (3.5mm – 4.5mm). When knitting socks, I prefer knitting sock weight yarn with size 2 needles (which I used here) and I had a gauge of 8 stitches per inch which is generally where I wind up with sock yarn. 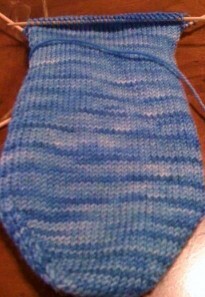 I love the way the sock turned out and I can’t wait to try Socks-to-be yarn again. 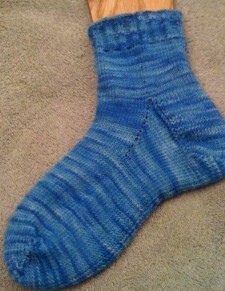 You can find Socks-to-be Yarn on ﻿Etsy, Twitter and the Socks to Be Yarn Blog. Disclosure: Socks-to-be Yarn provided iKnit2Purl2 with a 50 g sample of Sock Weight Handpainted Yarn free for review. iKnit2Purl2 was not compensated for this blogpost. All opinions in this blogpost are that of iKnit2Purl2’s and do not necessarily reflect those of Socks-to-be Yarn.